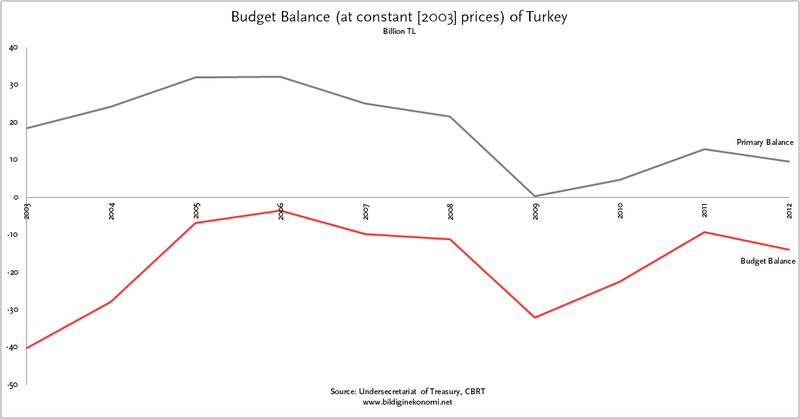 Observing the trend of Turkey’s Budget Balance from 2003 to 2012 (at 2003 basic prices), we note that the government presistently gives a budget deficit (Table 1). The budget deficit, decreasing from 2003 to 2006, starts to rise after 2006. In 2009, a significant increase in the budget deficit occurs as an effect the global crisis. After that, the budget deficit shows a decreasing trend until 2011. In 2012, it starts to rise again. Economists, in order to study the budget performance of countries with sizeable foreign debt, consider, in addition to the Budget Balance, the Primary Balance. Primary balance is calculated by subtracting from the budget revenues only the non-interest expenditures (excluding the debt servicing). The data shows that, Turkey has persistenly managed to achieve a primary surplus throughout the period (with the exception of a relatively smaller primary surplus achieved in 2009). This means that the government of Turkey, for the past ten years, has serviced her debt consistenly and reduced its accumulated debt. However, before making a conclusion, giving some careful attention to the broader context may prove to be useful. During the same period (2003-2012), when Turkey achieved a sustained primary surplus, the country continued to have a foreign trade deficit (see Foreign Trade from a Historical Perspective) and does not have enough savings enough to cover this deficit (see Savings and Investments). To summarize, while the government has been trying to reduce its budget deficit, Turkey increasingly relies on private sector and individual borrowing. In fact, it is possible to claim that the fact that the government of Turkey has been consistent in servicing her debt did help Turkey to be rated positively as an investment destination by international rating agencies such as Standard and Poors and Moody’s. Please also see the entry on Balance of Current Account for a more detailed discussion. Dataset is retrieved from Undersecreteriat of Treasury website, “Hazine Müsteşarlığı Veri Dağıtım Sistemi” link. Note: Data is converted to 2003 basic prices using the inflation dataset.